Description: Hello everyone I made this lo for the Chirper Challenge http://www.chirperchallenge.blogspot.com/ we were asked to use a sketch from Scrap Sketch http://www.scrapsketch.com/ I used sketch #116. They have a lot of wonderful sketches so check them out!!! We also have to have a Cricut cut..I used the Animal Kingdom for Jungle Fever and the palm tree was Stretch Your Imagination. Palm tree cut at 5 and the Jungle Fever cut at 2. I also used Accents Essentials and cut the arrow at 2 1/4. The pp is Bungle Jungle from Sassafras Lass. The tiny alphas from MM. Rusty Pickle buttons, ATG gun, inks, distressing. The pic is of Cooper in June 2009, he is obsessed with anything jungle animals. He is 2. TFL!!!! Wow... 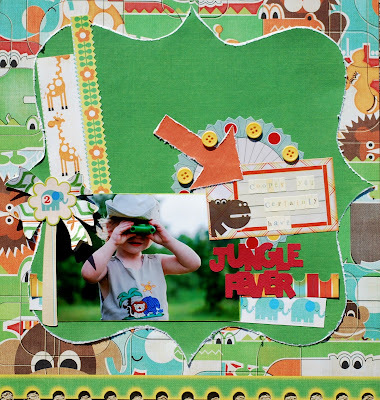 I love this Jungle lay-out, full of lovely details!! Again very creative!! This is just fab Dawn!! I am really liking the textures and colors. I apologize for not popping in lately. My PC completely quit on me a day before going on a vaca and then I had to get back and find a replacement and now Im setting it up...slowly but surely I will be back on track. Dawn, Cute, fun layout. Love your border at the bottom. Always adore jungle themes. Hope life slows down for you soon and you can WOW us more often. Miss ya!